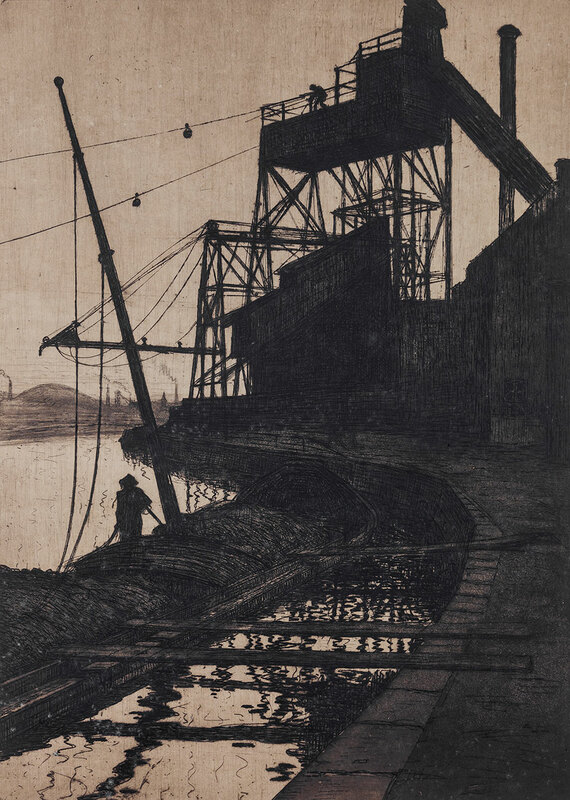 Paulus was an expressionist who made a name for himself with dark and oppressive scenes in which labour in the coal mines and the metal industry were at the forefront, in the spirit of Constantin Meunier, Eugène Laermans and other socially orientated artists. Walloon expressionist painter, etcher and lithographer. He initially studies architecture at the Brusslse Academie voor Schone Kunsten (Brussels Academy of Fine Arts). At the academy he gets to know Léon Thumilaire and Rik Wouters. Just like his friends he rents a small room above café La Rose du Midi in the Zuidstraat opposite the academy. He and Wouters supposedly attended a meeting of Vladimir Iljitsj Oeljanov, better known as Lenin. Often paints landscapes and nocturnes in which the slag heaps or ‘terrils’, factory chimneys, blast furnaces and cargo transportation on the Samber play a main role. Achieves recognition after participating in a big exhibition of Walloon art which the politician and aesthete Jules Destrée organises in Charleroi. Designs Paulus the Walloon cockerel, red on a yellow background, an assignment by the Assemblée Wallonne, which has since then become the official symbol of the Walloon province. Spends some time in London during the First World War, after which he sketches and paints as a soldier at the front. Establishes the group Nervia with fine artists such as Anto Carte, Léon Navez and Taf Wallet. When the artist becomes a peer he adds ‘de Châtelet’ to his surname, after his place of birth, Châtelet-sur-Sambre. Many of Paulus’ works are stored in the Museum of Fine Arts in Charleroi.